Fall Festival Game - Pop a Pumpkin - No Darts Needed! 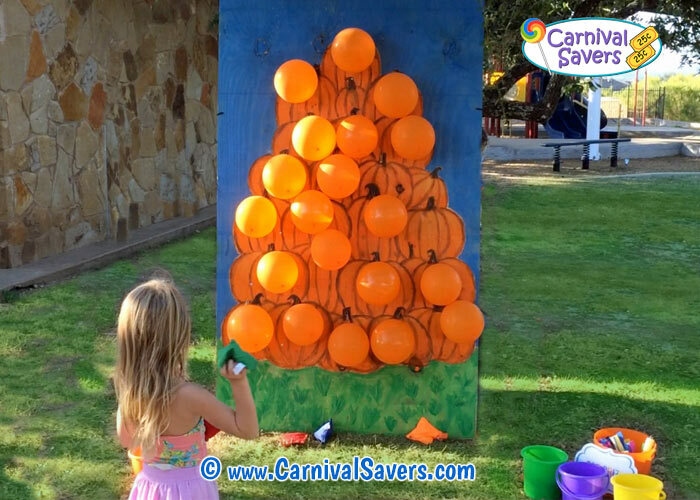 DIY Pop-A-Pumpkin Fall Fest Game! Tack "Off Center" to Prevent Too Many Pops! Fall themed Prizes and Top Prizes for the winners! Click to Download your FREE Pop-A-Pumpkin board pattern and enlarge (or use your own design). Using acrylic paint, have a volunteer paint a fall design on your plywood board on one side. Tip: Keep it Simple! We found that acrylic paint works well, but if you do only one coat, some of the natural wood design will show through the paint. Once the painting was finished with our board, one coat seemed to be just fine! Next, after the paint has dried, have an adult nail each clothespin on the side to the board directly on the stem of each pumpkin where you plan to place a balloon. Note: Resist the temptation to hot glue the clothespins flat to the board. We found in our testing that the bean bags can cause the balloons to come off the board frequently unless they are on their sides! By attaching the clothespins on their side using a nail through the metal part of the pin, this does not tend to happen! To attach the tacks to the board, each tack should be about 4 - 5 inches below each clothespin AND "off center" by about 2 inches, using the hot glue gun. 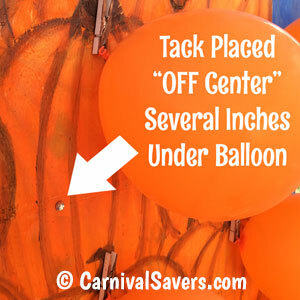 NOTE: In testing, we found if the tacks were centered under the clothespins balloons were far to easy to pop! gust of wind does not knock this game over! 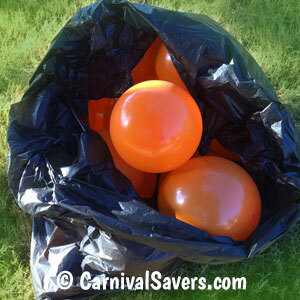 A few days before your festival, have adult volunteers inflate balloons and store in large, yard garbage bags so they are ready for the game. 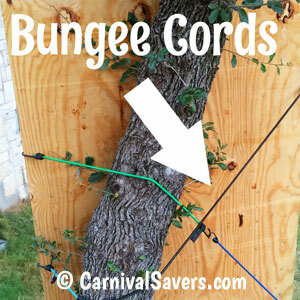 by weighting them with baseballs or other weights. Players are given 3 Bean Bags for a chance to pop 2 balloons to win a top prize. 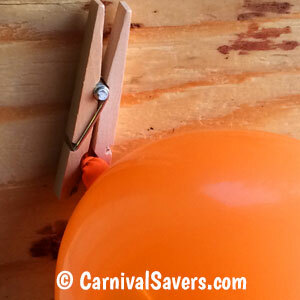 Kids love to pop balloons, and this ia a fantastic and safer alternative to dart balloon game with a fall flair! Also, this DIY Fall Festival Game is sure to "advertise itself" with its large size, and bright colors that you can place leaning against a tree in the shade, a brick wall or even indoors! Note: For younger children, you may wish to give them 4 bean bags or let them stand 1 - 2 feet closer to the board so they have a chance to win at this game too! Please follow the guideline of the Consumer Product Safety Commission with regards to balloons, broken balloons and young children. Click here to download this child balloon safety pdf. Allergy Information: We just learned that people who have severe latex allergies can have a reaction to bursting balloons. For schools, it may be wise to talk with administrators to verify all child allergies first. Also, consider changing this game to the "Pumpkin Pile Bean Bag Toss." Use our Free printable pattern, and cut out 4 - 6 pumpkins as holes for the bean bags! FALL PRIZES and DIY SUPPLIES for the POP-A-PUMPKIN BALLOON GAME!